Round 4 of the FQ Cup in SWQ was played at Clive Berghofer Stadium, Toowoomba on Tuesday night 15th April at 7.00pm. In an extremely close thrilling game, congratulations to SWQ Thunder defeating Willowburn 2-1 win in extra time..
With the score locked at 1 all at full-time, ( Goals to Coen Oates for Thunder '59 and Eddie Balazero for Willowburn '85) and witha result required, both teams went into extra time. 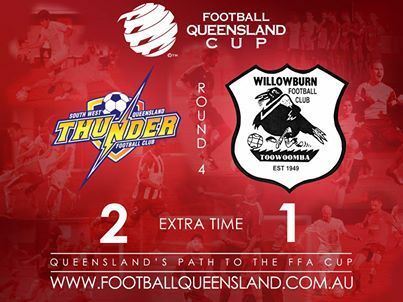 A goal to Thunders Daniel Fuller in the 107th minute secured the win for SWQ Thunder. Hosted by Football SWQ, this game was played in good spirits before an estimated crowd of over 500. Thanks to Football SWQ, SWQ Thunder FC and Willowburn FC & helpers for putting on a fantastic night, and thanks to the football community for your support of the FQ Cup. Thank you to Referees Christie Robb, Kehan Ryley, Sitha Mead & 4th Official Ethan Quinlan for officiating on the night. SWQ Thunder now advances into Round 5 to play the Gold Coast winner- Palm Beach Sharks NPL Team at a date and time to be advised by FQ before Sunday 11th May..